Some kart racers are content to let you shift gears. 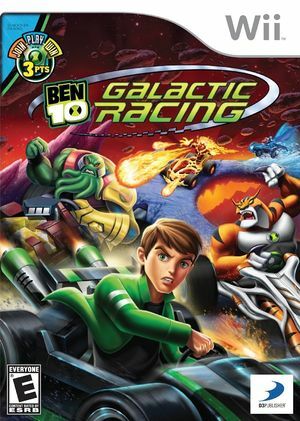 Ben 10: Galactic Racing lets you shift forms! After battling aliens throughout the universe, Ben is ready to battle them on the track! Use your Ultimatrix as a mid-race mega power-up, shift into alien forms, and gain an advantage over your opponents. But they won't just let you run away with the checkered flag. The courses are packed with Omni-Node power-ups that deliver an instant boost of alien ability. Race as one of 12 characters - including the new alien Fasttrack - on different 12 courses. Compete on the Grand Prix Circuit, run a Quick Race, or challenge up to three friends in multiplayer. The graph below charts the compatibility with Ben 10: Galactic Racing since Dolphin's 2.0 release, listing revisions only where a compatibility change occurred. This page was last edited on 14 January 2018, at 10:21.